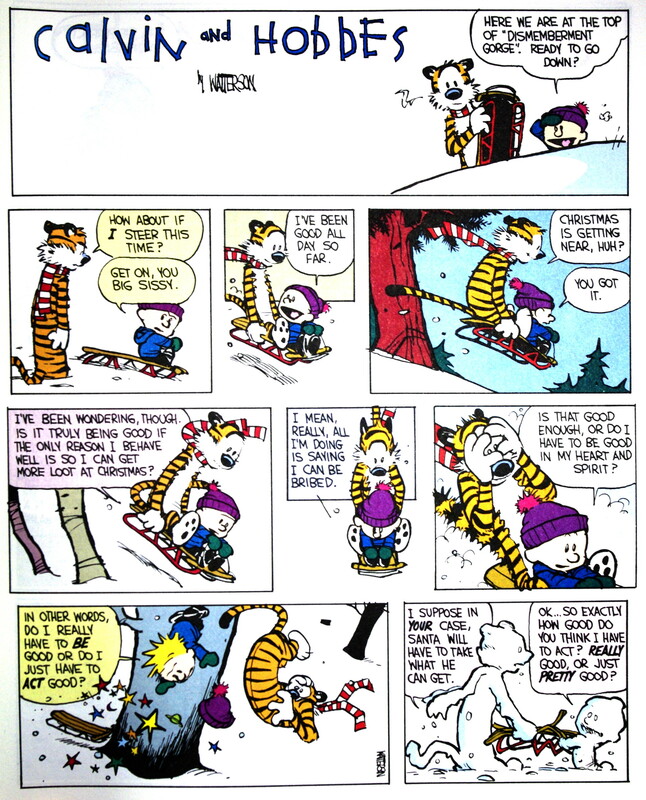 Sled rides, slush balls, Susie Derkins, Santa Claus, deranged snow goons, a sneak attack tiger, and a wildly imaginative boy are all part of what make Calvin and Hobbes by Bill Watterson perfect for the winter season. Several of Bill Watterson’s collections of Calvin and Hobbes contain delightful and entertaining wintertime stories. Comic strips set during winter can be found in Attack of the Deranged Mutant Killer Monster Snow Goons (pp. 68-108), in It’s a Magical World (pp. 137-end), in The Calvin and Hobbes Lazy Sunday Book (pp. 44-54 [this repeats part of the winter section in The Authoritative Calvin and Hobbes] and pp. 91-103), in The Authoritative Calvin and Hobbes (pp. 104-138), and in several other collections. Each story is packed with humor as Calvin combats his desire to be on Santa’s “good” list with his desire to slug Susie with a snowball. Calvin’s letter-writing marathon to Santa takes different approaches at pulling the wool over the old man’s eyes – from legalistic arguments to “presume innocent until proven guilty” to fine print qualifications of the statement “I have been extremely good* this year.” Then, there are the hilarious snowball fights, death-defying sled rides, encounters with snow goons, and monopoly games which end in scuffles and name-calling. Even though the comic’s conclusions are usually shallow, that does not mean one’s own conclusions have to be. For a short wintertime adventure full of comedy, philosophy, hyperactive imagination, a tiger named Hobbes, and a boy named Calvin, sit down by a fire with a cup of hot cocoa and read Bill Watterson’s timeless comic.